(घ) क्या केन्द्र सरकार ने इस संबंध में संबंधित राज्य सरकारों की राय मांगी है और यदि हां, तो तत्संबंधी ब्यौरा क्या है? (d) whether the Union Government sought the opinions of the concerned State Governments in this regard and if so, the details thereof ? 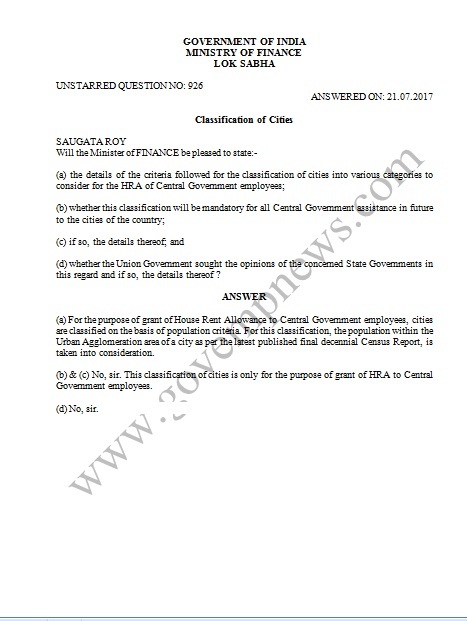 (a) For the purpose of grant of House Rent Allowance to Central Government employees, cities are classified on the basis of population criteria. For this classification, the population within the Urban Agglomeration area of a city as per the latest published final decennial Census Report, is taken into consideration. (b) & (c) No, sir. This classification of cities is only for the purpose of grant of HRA to Central Government employees.